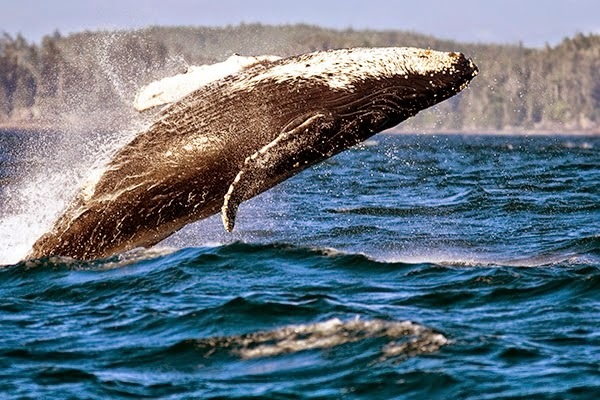 The waters of Clayoquot Sound off Tofino, a remote hamlet on Vancouver Island’s west coast, are spring feeding grounds for gray and humpback whales and the occasional orca. Up to 20,000 gray whales pass through here each year on their trek north from Mexico’s Baja Peninsula to Alaska’s Bering Strait. The Whale Centre and local tour boat operators offer whale-watching trips, plus bear- and bird-watching tours and excursions to natural hot springs with whale sightings along the way. Since the whales chase salmon, herring, and baitfish into inlet waters, it’s also possible, at times, to spot the giant cetaceans from shore. “We watch whales from the beach sometimes,” says Jeff Mikus, a commercial fisherman and co-owner of Tofino’s Wildside Grill. “Take the dog for a walk and the whales are spouting in 30 feet of water right off Chesterman’s Beach.” And, according to Mikus, killer whales occasionally cruise by the Wickaninnish Inn into the inlet. “You could be sitting in the Point Restaurant having dinner and watch the whales go by.” Whale-watching season officially kicks off with the Pacific Rim Whale Festival, March 14-22, and continues through October. How to Get Around: For local travel, driving is the most convenient option. There’s limited taxi service and limited public transportation to nearby Pacific Rim National Park Reserve. To reach Tofino from Vancouver, take the passenger/vehicle ferry from Horseshoe Bay to Departure Bay (Nanaimo) on Vancouver Island (an hour and 40 minutes). Then drive, rent a car, or take the Tofino Bus from Nanaimo to Tofino (three to four hours), located at the western terminus of the Pacific Rim Highway (Highway 4). Or fly from Vancouver International Airport to Tofino (an hour-long trip), and rent a car. Where to Stay: At the 75-room Wickaninnish Inn on North Chesterman Beach guest amenities include binoculars and ocean views from every room. Scan the sky for eagles and the water for dolphins, seals, and the occasional whale. To up the odds of seeing marine life outside your window, request a south-facing room in the Wickaninnish-at-the-Pointe building, which sits on a rocky point overlooking the ocean. What to Eat: Tofino is surrounded by water on three sides, so most wild salmon, halibut, lingcod, spot prawns, and other seafood served locally are boat-to-table fresh. Try the unofficial Tofino signature dish—fish tacos—outdoors at the Wildside Grill and indoors at foodie favorite SoBo (Sophisticated Bohemian). Wildside co-owner Jeff Mikus can tell you where and when the lingcod in your tacos was caught. And SoBo’s co-owner and chef Lisa Ahier shares her recipe for the restaurant’s “killer fish tacos” (spicy wild halibut and salmon topped with seasonal fruit salsa) in The SoBo Cookbook: Recipes from the Tofino Restaurant at the End of the Canadian Road (Appetite by Random House, 2014). What to Buy: At the Reflecting Spirit Gallery locations in Tofino and Ucluelet shop for wood and stone carvings, jewelry, metalwork, pottery, paintings, and other pieces crafted by Vancouver Island artisans. Works by over 200 First Nations and non-native artisans are available for sale in the galleries and online. What to Read Before You Go: The digital version of Among Giants: A Life With Whales (Lightbox Press, 2011) chronicles the life of Flip Nicklin, one of the world's leading photographers of whales and a founding member of Whale Trust Maui. Included are over 150 photos, plus audio, video, pop-up images, and Nicklin’s personal commentary. Practical Tip: Spring temperatures in Tofino are mild (average March to May high temperatures range from 50º to 60ºF), but it can get cold, wet, and windy on whale-watching tours. Bring a tuque (a knitted, wool, or fleece beanie hat), winter-worthy layered clothing, and closed-toed footwear. Fun Fact: To get a better sense of what’s going on around them, a whale can “spyhop,” or hold its head straight up out of the water for minutes at a time. The maneuver, which gives the appearance that the whale is treading water, can be performed with eyes above or below the surface.